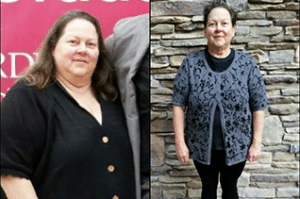 From insulin pump to diabetes-free! Let’s be honest. We have all “been there”. When I met Dr. Gutman in mid-May my health was at an all time low. I was sick and tired of always feeling sick and tired. After spending over a month on several antibiotics with no relief, I was searching for help. I suffered from diabetes (insulin pump dependent for 10+ years), heart disease (quadruple bypass surgery), 3 heart attacks, high cholesterol, diabetic retinopathy, thyroid disease and YES I was extremely overweight – All of which kept me from enjoying my life and family. As another birthday was fast approaching, I decided it was time to end the madness of my unhealthy lifestyle. Little did I realize giving myself the Cleveland Nutrition program for my birthday would turn my health/life around so dramatically and in record time. How can we expect to find answers and good health guidance in a 15 minute doctor visit that ends with a prescription and follow up in 4-6 months; only to be at the same frustrating point, year after year after year! Look over the entire Cleveland Nutrition website, fill out the patient registration forms (be honest – your personalized plan and coaching is truly the key) and schedule a consultation with Dr. Gutman. The reduction in my medical costs has more than paid for the program. Dr. Gutman individuallizes a nutrition plan specifically for your health needs. He treats all of his patients with respect and concern for our well being. His ongoing coaching and communication was the key to my successful transition to my new lifestyle. No other program will bring the same results as Cleveland Nutrition. The claims are 100% accurate. I signed up for the program immediately after our consultation. The best gift to myself, EVER! It has been such a rewarding experience. Wish I would have found Dr. Gutman years ago. Note: Results may vary from person to person. There is no guarantee of specific results.